In the previous EUR/USD Weekly Review, we noted that the SMA 50 was now pointing upwards. A crossover by the SMA 20 to the upside would suggest further bullish advances. Historical technical resistances ahead would be 1.44 / 1.46 and the down trend slope plotted from recent previous highs. From a fundamental perspective, the Euro Zone budget deficit crisis seemed to be past it’s worst as Euro Zone leaders agreed on a 159 billion euros package of new aid for Greece. On the contrary, the US faced disagreements regarding on a decision for the raising of the US debt ceiling. Rating companies continued to caution on the possibility of a rating cut and negative outlook. Looking at the EUR/USD chart above, we note that the 1.44 line continues to offer a strong resistance. The spike up and down were probably knee jerk reactions. In the previous EUR/USD Weekly Review, we mentioned that a crossover of the SMA 20 to the upside might bring about more bullish advancement. This did not happen and the currency pair remains to be in a consolidation phrase. The almost flat SMAs are suggesting this too. Watch out for the psychological levels of 1.42, 1.44 and 1.46. A breech of the extreme ends may suggest a new momentum. After Wednesday’s high wave spinning top we have Kiwi slowly easing off the new historical highs with daily indicators showing a topping off in macd’s and stochastic coming off overbought levels. From the 4H picture we have a confluence of bears as macd drops and stochastic head for oversold territory. Hourly indicators also show a confluence of bears, with macd opening lower and stochastic dropping. We are in the process of taking out a strong support at 0.8678, with bias continuing to call for the sell side of the market. Following Wednesday’s bearish engulfing, yesterday saw a bearish enough candle to confirm a possible daily level bearish reversal with the three outside down pattern. Among the indicators we have macd topping off and stochastic heading for oversold levels. In intraday charts we are seeing mixed signals though poised to go bearish. Note 4H stochastic appear to be ready to cross lower inline with its macd, in hourly charts we have macd topping off and stochastic dropping. For now look for a close under 1.4280 on a 4H basis before taking action. Thursday saw a technical rebound courtesy of the EURGBP cross, daily indicators continue to see stochastic coming off overbought levels while macd is rising. Note we did have a dark cloud cover from Wednesday that remains inviolate. From the 4H picture we have a long wick in the prior candle while macd is dropping and stochastic looking for a bear cross. Hourly indicators see stochastic heading for oversold levels and macd topping off. We appear to have a bearish bias overall though with prices just above a support. Look for a push under 1.6343 for a short to 1.6311 then on to the daily EMA lines. Thursday saw a bounce off the two week-ranging market floor, 126.67 with the candles giving us a hammer at the close. Daily indicators are mixed with stochastic heading lower along with bearish EMA lines while macd is still pointing up. From the lower time frames we have a bullish bias in the 4H picture with macd bottoming out and stochastic heading for overbought areas. Hourly candles are mixed with macd rising and stochastic heading lower. Consider buys from just above 127.08 with tight stops for 127.74 then 128.10. Daily candles show a dark cloud cover with stochastic coming off overbought levels, macds however are still pointing up. With prices well above the EMA lines, our pattern suggests that its now time to look for a pullback. Intraday we triggered a double top with the push under 1.1012 while indicators in both the hourly and 4H picture see macd’s dropping while stochastic in the former see a new bear cross and is oversold in the latter. Consider shorts from just under 1.1012 for 1.0930, stops at 1.1040. After ignoring the debt cieling issue for some time now US equities saw sharp losses Wednesday as we get closer and closer to the August 2 deadline with little resolution in cite. Hoouse republicans today are expected to put to the floor the Boehner proposal which calls for a staggered increase in the debt cieling making sure that the problem will again arise just ahead of the 2012 vote a proposal which the Democrat controlled senate has already indicated would find itself dead the moment it enter the upper house. Although prospects of a default in the US has been weighing on the greenback note that the likelyhood of increased rates following a default or a downgrade is beginning to stem the dollars losses as any exit by foreign money out of US treasuries may be offset by reverse flows of US capital. Cable saw a dark cloud cover at the close Wednesday with daily stochastic coming off-overbought leevels and macd’s rising. Note we have been far-off the EMA lines for sometime, the pattern would be a good excuse to pullback further to the EMA lines. In intraday charts we find a confluence of bears from 4H level with stochastic already oversold. Hourly indicators for their part sees stochastic poised at a bearish cross while macd is also heading lower. Given the equity sell-off we retain a risk averse view, consider shorts from just under 1.6339(41) for a test of Wednesday’s lows then on to 1.6262 possibly 1.6193. Stops at 1.6365. At the close we saw a bearish engulfing pattern in EURUSD yesterday dragging daily stochastic out of overbought levels though macd’s remain technically bullish. 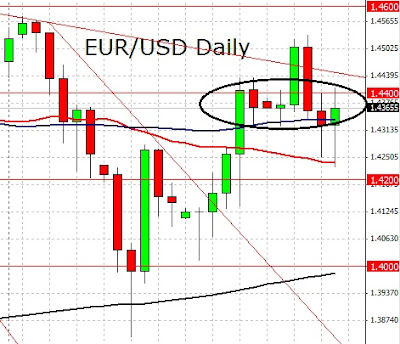 We have for our immediate support the daily EMA lines clustered at 1.4316. From the 4H level we have stochastic in oversold territory while macd is dropping, note we have a dragon fly doji among the candles defining the floor. Hourly indicators are mixed with stochastic dropping and macd bottoming out. We are just under a congestion resistance, possible sell-area, though there appears to be little appetite for taking action. Consider shorts at market with tight stops at 1.4385 for a high risk-reward ratio. With Wednesday’s rally AUDUSD saw fresh historical highs with daily stochastic staying flat in overbought territory while macd’s is also rising to suggest a healthy uptrend. Note the sharp movement the past two days has pushed prices well-off the EMA lines. Intraday we see 4H indicators capping the upside as stochastic heads lower from overbought levels while macd is also topping off. Hourly indicators see macd’s dropping while stochastic is also crossing lower off the overbought levels. Immediate risk calls for a bear market though we can only take action coming from the 1.1080 area or on a close under 1.1012. After seeing new highs NZDUSD closed with a high wave spinning top suggesting once again the potential for a pullback. Daily indicators however see a bullish macd with stochastic reentering overbought levels. Intraday we are seeing mixed markets with 4H charts initially seeing a dark cloud cover and now a morning star following a brief sell-off. Signal wise 4H macd is down while stochastic has just crossed up. Hourly indicators see macd’s poised for a bullish cross while stochastic is at risk of coming-off overbought levels. Note we appear to be forming the right shoulder of an SHS pattern with its breakout point around 0.8674. Given all the mixed signals we prefer remaining sidelined though patterns suggest that the immediate risk is for a pullback to 0.8674. At the close we amanged to trigger a double top in the 4H and daily charts with daily stochastic heading lower and macd flat though technically bullish. Note we were rejected from the bearish daily EMA lines. From the lower time frames we have a confluence of bears from the 4H picture with macd dropping further and stochastic oversold. hourly indicators see a new bear cross in stochastic along with a bearish macd. For now given proximity to a strong support we prefer looking for a close under 111.50 before jumping short or look for a rejection from 112.37 as an entry. The EURUSD continued its bullish momentum yesterday, topped at 1.4524 and closed at 1.4507. The bias is bullish in nearest term, but so far price still unable to make a significant breakout above 1.4520/40 resistance area as you can see on my hourly chart below. So actually from hourly chart point of view, price still trapped in the range area of 1.4520/40 – 1.4436 and need a clear break above 1.4520/40 to continue the bullish scenario testing 1.4577 before targeting 1.4695. On the downside, a failure to make a clear break above 1.4520/40 could lead price to a minor downside correction testing 1.4436 support area. I do not expect any move below that area as it would diminish the current strong bullish bias but as long as price stays above the trend line support my overall intraday bias remains to the upside. The EURJPY had a bullish momentum yesterday but still unable to make a clear break above 113.40 key resistance area so far. The bias remains bullish in nearest term especially if price able to make a clear break above 113.40 testing 114.75 and the trend line resistance (white). Aggressive intraday traders can still short around 113.40 with a tight stop loss. Immediate support is seen around 112.50 and the minor trend line support (red) followed by 111.45. The GBPJPY had a bullish momentum yesterday, hit 128.15. Overall there are no changes in my daily technical outlook where price is still in a bullish correction phase since the bullish momentum from 124.85, testing the trend line resistance (red) and 129.40 especially if price able to make a clear break above 128.40. Price also has been moving in a sideways mode, so aggressive intraday traders may still short with tight stop loss above 128.40. Immediate support is seen around 127.77 followed by 126.60 region. Price is in a bullish intraday phase, but only a break above the trend line resistance could trigger further bullish scenario and as long as price stays below the trend line, any bullish movement should be seen just as a corrective movement. The AUDUSD continued its bullish momentum yesterday and had a significant bullish continuation earlier today in Asian session, hit a new historical high at 1.1061. The bias remains bullish in nearest term aiming for a new historical high projection around 1.1100/50. Immediate support is seen around 1.1010 (former historical low). A clear break below that area could lead price to a neutral zone in nearest term but until we have a technical sign of correction/reversal, my overall technical bias remains strongly to the upside. The GBPUSD had a significant bullish momentum yesterday, strongly broke above 1.6338 and hit 1.6438 earlier today in Asian session. This bullish momentum is the continuation after the violation to the bearish channel and a break above 1.6192, targeting 1.6545. A clear break above that area would open the door for further bullish scenario testing April high at 1.6745. Immediate support is seen around 1.6370 followed by 1.6338. Only a clear break back below 1.6338 would change my bias to a neutral zone in nearest term and could open the door for further bearish pullback testing 1.6192. Tuesday saw a flag pattern triggered in Euro with theoretical targets at 1.4732. Daily indicators show a bullish set of signals with stochastic in overbought levels and macd rising. Note daily EMA lines are also forming a new golden cross. In 4H charts we have stochastic in overbought territory while macd is heading up to suggest an uptrend exists. hourly indicators see a bearish macd and stochastic at risk of a bear cross. Given the strength of our immediate resistance level we prefer taking the buy side of the market from the supports rather than jumping at the break of the days highs. We continue to see a bullish bias for Cable with the daily indicators showing a new confluence of buys, stochastic crossing higher while in overbought territory. From the 4H level we see a confluence of buys stochastic overbought and macd’s rising once more. Hourly indicators appear to be indecisive with macd flat though technically bullish while stochastic is poised to either cross lower or push to overbought territory. Given the strong resistance at 1.6467 we prefer a buy on dips approach to the 1.6402 region though a close above 1.6467 is also a bullish entry sparking another up-leg. At the close AUDJPY found itself inside the daily EMA lines with indicators still calling for a push higher as stochastic remains poised to reenter overbought territory and macd’s cross up. In intraday charts we have candles suggesting mixed markets in the hourly and 4H levels while indicators show a confluence of bears for the former. Hourly stochastic has just crossed down inline with macd. From the 4H level we have mixed signals with macd up and stochastic dropping. Given the USDJPY trend we would prefer shorting AUDJPY on a break of 85.28 though we should keep a close eye on the CPI data, with actual numbers above 0.7% likely to see us spiking instead. Daily charts saw a big spike yesterday in Aussy following the broad based dumping on the greenback as the US inches closer to a default. Daily indicators show an overbought stochastic crossing up while macd’s are also headed higher. Intraday we have 4H indicators with a confluence of buys while in hourly charts signals are mixed with macd’s is a heading lower as stochastic pushes up. Given the release of Australian CPI in a while the prefer course of action is to wait with stronger than consensus numbers, i.e. greater than 0.7%, likely to spark a run for historic highs while weak results should see us heading lower. The USDJPY continued its bearish momentum yesterday, closed below 78.24 and hit 77.77 earlier today in Asian session. The bias remains bearish in nearest term testing 77.35 before retesting 76.21. On the upside, another move back above 78.24 could lead price to neutral zone in nearest term but as long as price stays below 79.55 my overall technical bias remains strongly to the downside.